Jay Sluiter working outside his West Albany garage on Friday. If you see the nose of an airplane sticking out of a residential garage on an Albany street, you wonder what’s going on. So you take a closer look and might even walk up and talk to the guy working on the plane. It’s in the 800 block of Takena Street SW, where he and his wife live in a meticulously renovated home, that Jay Sluiter, 68, is rebuilding a 1958, twin-engine Piper Apache Geronimo. Part of it anyway, the nose and the cabin where the pilot and up to three passengers sit. The other parts, such as the wings and the tail, are at the Albany Airport, where the Sluiters keep their two planes that are in top running order, one of which they take on flights around the country now and then. Don’t worry about interrupting Jay Sluiter (pronounced “Slyter”) while he works, as I did Friday. Over the summer, neighbors watched him build a beautiful front yard and handsome fencing after earlier completing work on the house itself. Now the Piper is his favorite project, and he loves to tell you about it. He’s a lifelong pilot and mechanic. But for 15 of his younger years he worked as a teacher and school principal in Albany, N.Y. Then he went into the private sector as an engineer on engines and such. Before he retired, he also worked for the federal government, running a Job Corps center. 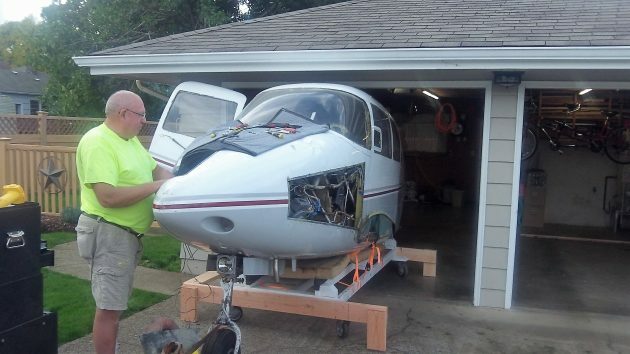 Why tow the Piper’s fuselage to his garage, which he did about three weeks ago, causing a sensation in the neighborhood as everybody came out to watch? Well, he can work on it close to the comforts of home, rather than in a hangar. He can listen to music, and he avoids the commute. And he can wheel the assembly out into the sunshine when the weather is fine. 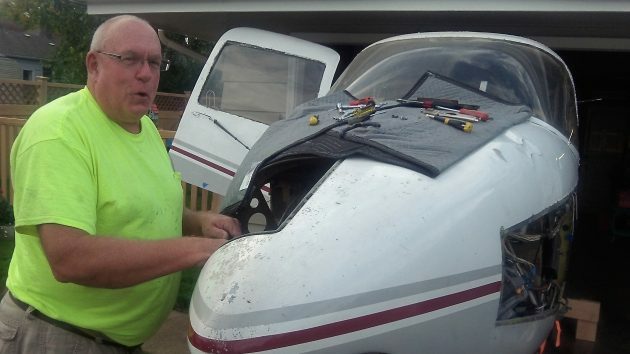 The plane he intends to make airworthy again had about 8,000 hours in the air when it suffered what Sluiter calls a hard landing in January 2015 at an airport in Washington state. Its landing gear broke and it landed on its flaps, possibly damaging the engines and ruining the propellers. The owners put the ruined craft up for auction, and Sluiter was able to snap it up for $2,000. Now he plans to replace the ruined motors with modified Honda automobile engines. And he’ll replace a lot of the other original parts with modern ones that are better, including the radio and hydraulic controls. By the time the Piper is ready to fly again, which he figures will be a year from next May, he’ll have spent at least 1,000 hours and close to $30,000. A steep undertaking? Yes, but Sluiter is no stranger to meeting big challenges. In 1993, some time after he lost his left leg in a motorcycle accident, he rode a bicycle across the United States from Seattle to Boston. Covering 70 miles a day pedaling with one leg — it was hard at first, he admits. But he still relishes the experience. People were wonderful along the way, sometimes inviting him to their homes to spend the night. He claims never to have had to pay for a meal. The other day a high school girl with a camera stopped by the plane. She had an assignment due Monday for her photography class and had not yet found anything to shoot. And now she had something! Sluiter figures she might be about to graduate when the plane is ready. If so, she’s in line to be invited to go along on a flight. Jay was happy to talk with a passerby curious about his airplane project. Tags: aviation, Jay Sluiter, Piper, plane restoration, West albany neighborhood.